I have become a Twitch streamer. You can come harass me as I fail to beat The Legend of Zelda, even slowly. And possibly other games, too! SuperJer's YouTube Channel added to front page. I've been posting speed runs and other videos for a while and figured it was time to link up. So! Enjoy! 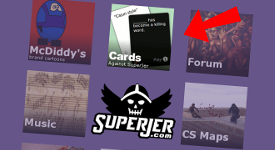 SuperJer Against Humanity v1.0 out now! It's like Cards Against Humanity™®OMG but online and with all new cards. Thousands of them! Gather some friends and play some offensive, stupid, yet highly conceptual cards today. It's free and only requires a SuperJer Forum account, which we are giving out for the web-exclusive price of: bugger-all! 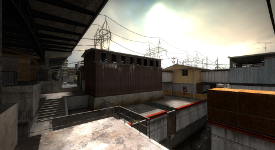 Nezumi and I have ported de_substation to Counter-Strike: Global Offensive for your "global amusement." Point your Steam-client and or generic web-client to the CS:GO workshop to "subscribe" which is Valve-ese for "get," apparently. 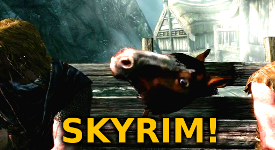 Because there just weren't enough Skyrim glitch videos on the Internet.